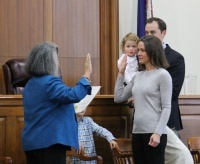 Heather Hill won election to the Charlottesville City Council on November 7, 2017 as a Democratic candidate, placing second in a six-way race. She and Nikuyah Walker were sworn in on December 29, 2017. Hill was selected by Council as vice mayor at the first meeting of 2018. This page was last edited on 3 January 2018, at 15:36.